Last Friday I installed a new thermostat in the house, the first one since we moved in. Now the prior thermostat was programmable, hourly and daily you could configure it to heat and cool as you like. It made a lot of sense at the time, but so did parachute pants. Yeah, it’s been a while. Unfortunately programmable thermostats don’t take into account when you’re gone, you have to remember to override the programming (time-consuming and bothersome) or turn the thing off (and come back to a frozen cat.) But it was better than the manual option of course. 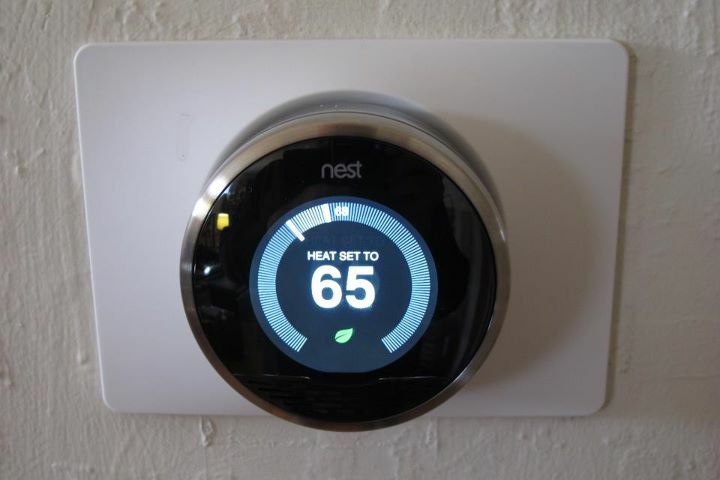 Now a company called Nest has come out with a Learning Thermostat. One that tracks your use, and presence, and uses that information to anticipate the best settings for you at any given time. It’s also a green device, and will help you try to use less energy while staying comfortable. The new thermostat. The green leaf means we're saving electricity. And that we're cold. I’m not going to rewrite their web page (which you can view here) but wanted to show you a little walk-through video I made to answer all my geeky friends questions. Click here to enjoy the video on YouTube. This entry was posted in Design, Geeking around, Health, Home and Family, Personal, Random thoughts, Technology, Uncategorized. Bookmark the permalink.